Ahh yes, a true barber. Not a hairstylist from unisex salon. But a familiar name of the man who cut your hair and gave you the best shave of your life. Might have been Sal. Frank or Bob. And he knew your name as well. Right as you walked in the door you were greeted and felt instantly comfortable. The barbershop was your place; it was where you belonged. And you could always be yourself in the shop – unapologetically male. There is a shop and a barber like that today on Magazine Street in New Orleans. The owner and head barber is no doubt refined – but he’s also a bit rogue. Cocky? Ehh, more like confident. And always honest. Most importantly, he has a passion unrivaled by anyone else in the barbershop trade. He’s a straight shooter who speaks his mind and won’t tolerate bores or BS. Quite refreshing really. His name? Aidan Gill. His shop? Aidan Gill for Men. Once you get to know him, over time, you’ll feel he’s got your back. And, truth be told, he really does. Because he’s the man who’s responsible for saving the barbershop from extinction. When others were taking the salon route, Aidan stuck with the tried and true. Because he saw the need for the service and had (still has) a passion for the experience. And where new barbershops are bringing a sense of an e-bay antique collection to their shops, Aidan has curated what has come to be known as a Barbershop museum – complete with a depth of tradition and knowledge that is unrivaled in this industry today. You might say that he has embossed his name into the rich and storied history of the barbershop trade. Reflecting on why barbershops are experiencing a strong resurgence, Aidan says it’s about being able to recapture the true spirit of being a man. Salons just don’t have that. It’s about providing a place where men can relax, converse, breathe and power down (no cell phones during your visit please). Over time, organically and appropriately, Aidan Gill has built such a place for men. He has created a safe haven with an edge that evokes the barbershops of yesteryear. Aidan has managed to blend the old with the new, giving his barbershop a twist with today’s technology applied to established grooming techniques. This whole thing is reflects a passion that ties directly to the work he loves. And it’s obvious, his staff feels the same. Aidan invites you to experience his respite and yours. It’s somewhat exclusive. In fact, if you’re too uptight, you might not make the cut. But more than likely, it’ll be an experience you’ll wish you could take home with you. And with his new products you can do a bit of that. But come join him for a haircut and a shave, and a taste of something rich and warm like smooth Irish whiskey. Come celebrate what it is to be a man with Aidan Gill – your barber. 1990: Aidan Gill for Men, Adams Street, New Orleans. This story has its roots, as so many do, in the Emerald Isle. A young man from Dublin, seeking to make his fortune, ventured out to London at the age of 17 – and stumbling onto the barbering business, he found his calling. A legend was born. This ambitious young lad had big dreams that brought him across the Atlantic to another fabled city, “The Big Easy” – New Orleans, Louisiana. Now it should be said that Aidan’s journey and the history of the barbershop tend to blend in a seamless fashion. So let’s step back a bit. In the golden age of the trade, barbershops came in a variety of shapes and sizes. Many with marble counters lined with glass-blown tonic bottles and barber chairs carved from oak and walnut and fitted with fine leather upholstery. Everything had an artistic flourish from the crystal chandeliers to the fresco-painted ceilings. Barbershops in the 1880s to the 1940s were social halls for men. In fact, these all-male hangouts rivaled saloons in popularity. It was a weekly ritual to not only stop in for a shave (and an eventual haircut), but also shoot the bull with your friends, the other regulars and barber. Entering this very comfortable world, a man felt welcome; it was his escape. As soon as the hot lather hit his face, his cares melted away. However, Aidan realized that an important part of a man’s lifestyle was in jeopardy. That of the barbershop experience. Many attribute this to the mass marketing of the safety razor while another obvious impact came from came from the longer, less-kept, fashionable hairstyles men wore in the ’60s and ‘70s. The unisex salons were all the rage. Instead of barbers, you got your hair cut by a cosmetologist. Instead of you being greeted by the scent of exotic smells, perm chemicals and mousse assaulted your nose. This certainly wasn’t the relaxing, male oriented environment that men had come to know over the years. So Aidan made it his mission to save the venerable barbershop from the brink of extinction. So again, Aidan decided the perfect place for resurrecting the true spirit of the barbershop was New Orleans. A little dark, a little dangerous…the birthplace of jazz, the mecca of Cajun and Creole culture and cooking was the perfect place for the brogue and bluster of Aidan Gill. Because this city appreciates people with larger than life personas and is known for mixing many cultures, flavors, accents and ideas. Aidan has embraced the city of New Orleans and like the gumbo it is famous for, has added a new texture and flavor to the mix. His barbershops have become a destination must for businessmen and celebrities alike – from around the world. It is amazing how much history and culture is built into this experience. After all, you don’t come from Dublin, travel to London and New Orleans without getting a whole lot of real world savvy and street-smart common sense along the way. Come experience the history of Aidan Gill for Men. Just one look and you know you’re somewhere special. 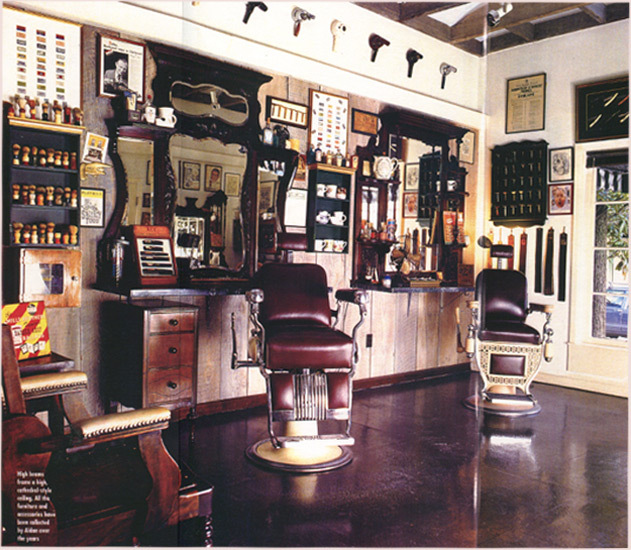 From the row of brightly lit, red and blue barber balls; to the huge collection of barber based artifacts, this place beckons you to peer in and discover the treasures within the shop’s walls. No doubt, you’ll notice the antique towel heaters, lined up one after the other, looking like aging robots, atop the rich wood grain cabinetry. This place, like it’s owner, has a lot of stories to tell. Like the saloons, speakeasies and men’s clubs of old, the rich, rich wood furniture begins to speak to you of words exchanged just amongst men. Aidan Gill’s barber chairs are vintage. Bathing you in leather, they make those characteristic sounds that take you back to your youth and the lounging chair that no one else was permitted to sit in – other than your father. The huge mirrors reflect the full scope of this richly detailed place. The large, heavy glass windows facing Magazine let you see the bustling street but keep it at more than arms’ length. You have arrived, and you’re going to stay for a while. There’s a stack of Playboys that dates back to the time when men were unabashedly bold enough to look at the centerfolds in broad daylight. Peruse the stacks upon stacks of irreverent books for sale that evoke the spirit and philosophy of the owner. Then ask him about his antique collection of leather bound beauties – especially the ones that chronicle the fascinating history of barbershops and shaving. Everything, EVERYTHING in this shop has been carefully researched, curated and understood by Aidan. The passion he has for the industry is more than evident. He is so happy to share some of these learnings, if you ask. He loves this stuff. Venture into the inner sanctum and sit yourself down into one of the most comfortable chairs on the planet. Experience a haircut that will make you feel like a CEO, even if you haven’t quite reached that rung yet. It will give you a polish that can only be compared to a custom tailored suit. Then treat yourself to a shave so close, your face will reflect your smooth persona. And just when you think, you’ve experienced the last hot towel, another is wrapped around your mug and you are so very grateful that you lost count. You’ll be so relaxed that you might drift off into a well-deserved slumber. And when your shave is through, you’ll be handed a glass from a collection of Irish whiskeys. A drink that takes it all down another notch, if that is even possible. Relaxation. No, you’ve never had it like this sir. There’s even a good chance you’ll share in the gift of gab with Aidan – as he makes his customary rounds through the shop. Stepping back onto the sidewalk of Magazine Street, you’ll feel revitalized, like a new man, ready to take on the world. You’ll feel – well, manlier. Why? It’s just the experience of this shop. When you step out of Aidan Gill For Men, a slight boost of confidence may follow. And above all, you will have just enjoyed a moment that is, unapologetically male.